I got a traditional gyveche (гювече) as a gift, and since it would be hard to replace here, I intend to take good care of it. 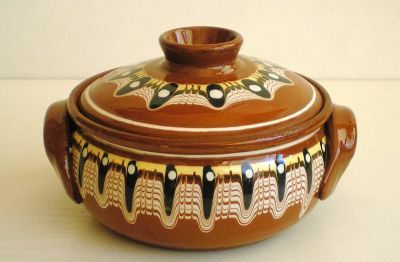 For those who don't know it, a gyuveche is an earthenware pot intended for baking a single portion of casserole-like mediterannean dishes. There are unglazed and glazed ones; mine is glazed both on the outside and the inside. That's a picture of one similar to mine. I have some trouble cleaning it. I'm not yet used to it, and sometimes bake the dish too long, which means that I get overbaked egg caked on the inside. My usual strategies against overbaked egg are a stainless steel wire pad and soaking. But I'm afraid that the wire pad will hurt the glaze and that soaking will seep into the clay. Is this really a concern? If I can't use wire pad or soaking, what is my best option? The rough side of the sponge isn't enough by itself. Also, if anybody has general tips about the care, I'll be glad to hear them. Speaking as a potter, do not use the wire pad. The pot you have is a very low-fire ceramic, and the glaze is most likely softer than steel, so a wire pad could scratch the inside of the pot irreparably. Note that this is not true of high-fire ceramic, which is harder than steel (as is glass). There is no issue with soaking the pot, really. Water will not hurt it. It is possible, even likely, that the clay will soak up water through its bottom or tiny cracks in the glaze. In this case, you just need to make sure the pot is dry before exposing it to sudden heat, or it could crack. Dry it on a dishrack, or even in a low-temperature (less than 200F) oven. Also, don't use very much soap while soaking it, as the pot may soak up some of the soap and affect the flavor of the food. Additionally, several companies make plastic or even copper scrub pads. I've found, in particular, that the red-and-yellow plastic scrub pads made by Tuffy are particularly effective for scrubbing delicate surfaces. I don't know if the copper scrub pads are pure copper, so I don't know if they will scratch your pot or not. Finally, let me also recommend against putting your gyveche through the dishwasher. Not only will this expose the pot to almost certain chipping, but the porous earthenware may soak up bleach which can both ruin your food and cause the clay to break down and chip or crack. By the way, that's a beautiful pot. I can see why you like using it. I anticipate someone being able to answer this better than me, but my guess is that the glaze totally protects the ceramic of the pot, as long as there are no cracks or chips in it. You should be able to soak and scrub (but I would avoid scouring) the pot with impunity. A rough edged sponge is almost always a better choice than a metal scouring pad when cleaning ceramic / most dishes. Pampered Chef gives its customers that purchase its "stone" baking pans a plastic scraper. My friend hasn't had any trouble with it damaging any of her cookware, and neither have I. You could see about finding a similar product and trying it. Not the answer you're looking for? Browse other questions tagged equipment cleaning balkan-cuisine or ask your own question. Are coffee mugs oven safe? How to take care of the teflon coated cookware to ensure their long life?